The period from May to summer is perhaps the most beautiful to experience in Tuscany. The landscape around us becomes magical, metaphysical, as well as for centuries, poets, travelers and painters have described it. A perfect, almost imaginary landscape: sunsets painted on the sky, hills that slowly from the green became colored, fragrant flowery meadows and enchanted villages with stories to tell. Colors, lights, scents: the nature around us seems to be singing. Each color is a different emotion, a different nuance, a different shade, like many musical notes of a symphony. Our special spring is a celebration of this colorful season. 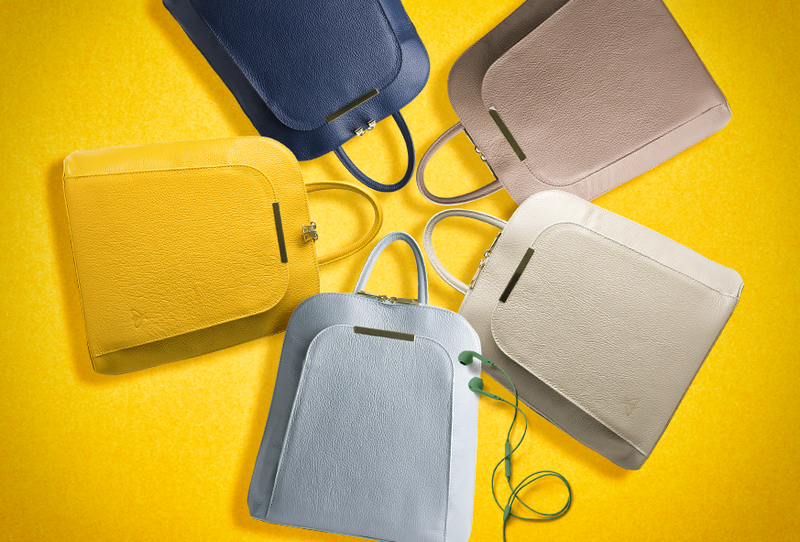 Each bag has its own color therefore an its emotions and its personality. We like to think that every person is unique and that there is a bag for every woman. For this reason we have chosen a selection of our most colorful bags, for a rainbow collection that tributes spring and that represents the many nuances that this season represents. There are bags to use every day, that accompany us in our small and large daily journeys. The bags to go out in the evening. They aren’t missing the hand bags, shoulder bags, travel bags and backpacks. Each of these bags represents a particular moment of the day and a moment in our different life. Whether you're on holiday or at work, in a street in the historic center of a city, or by train while you finally go home or on the embankment of a river ready to photograph the sunset reflected on the water, or a cloud, or a flower, or your child, what matters is color and the thousand nuances that can take. Leather bags are never the same but change with the light, with time, they are objects that improve over the years. Our Original Tuscany bags are all made of leather, handmade, in Tuscany, according to traditional techniques by our best craftsmen. Observe the colors, the details and imagine also the scent of these natural materials, worked with the utmost care and passion from people who have been doing it for generations. We, with the same passion, we want to show you and tell: a celebration of Italian beauty, in the most beautiful season, spring.